For quick reference all the photographs on this site are shown here with dates and detailed captions. Click on any image for a larger view. 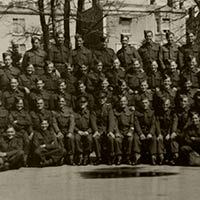 March 1941: A Troop, 285 Battalion, 72nd Field Regiment R.A. at Weston-super-Mare. 931569 lance-bombardier O.H. Perks (4th from right). 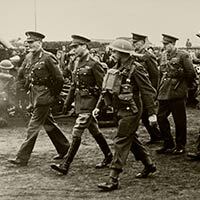 2 April 1941: H.M. King George VI inspects 72nd Field Regiment R.A. at the Beach Lawns, Weston-super-Mare (C.O. 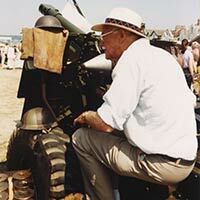 Lt. Col. Mould-Graham in tin hat). 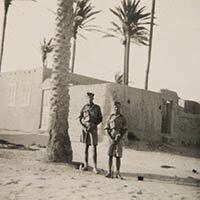 May 1942: Oliver (left) playing golf while at number five convalescent camp at El-Arish. 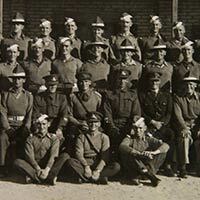 November 1942: Cadet O. H. Perks at OCTU (Officer Cadet Training Unit). March 1943: Gunners at OCTU (Officer Cadet Training Unit) at the R.A. base depot at Almaza, on the outskirts of Cairo (cadet Perks is 6th from left, 2nd row). 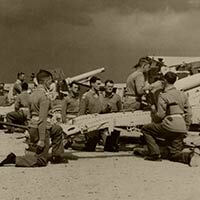 April 1943: Gun Laying Competition, R.A. OCTU, Acre, Palestine. Oliver can be seen 2nd from the right. 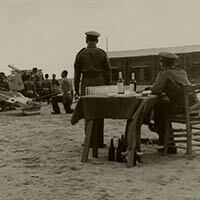 April 1943: Gun Laying Competition, R.A. OCTU, Acre, Palestine. Oliver can be seen on the gun furthest from the camera. 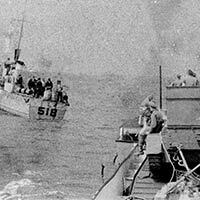 9 June 1944: LCT 2005 being taken in tow on D+3. June-July 1944: Aerial view of gun positions for E and F Troop, 465 Battalion, 90th Field Regiment R.A. at Abbaye Saint-Martin de Mondaye, Juaye-Mondaye, Calvados, France. June-July 1944: F Troop crew with 'Furious' near Villers-Bocage, Normandy. 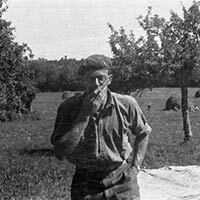 21 August 1944: Oliver enjoys a smoke at Gacé in Normandy. 5 September 1944: Taken by Willy Dumont in Brussels. 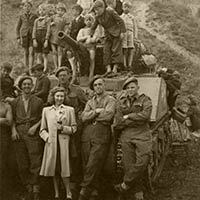 Message on the back reads "To our liberators THANKS!". Oliver can be seen standing behind Willy's wife Mevr Dumont. The other gunners are (left to right) Stratton, Horner and Hugo. 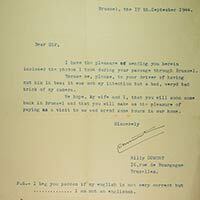 17 September 1944: Letter from Willy Dumont enclosing photo taken in Brussels of Oliver and one of his gun crews on 5 September 1944. 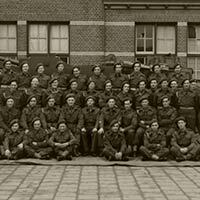 February 1945: F Troop, 465 Battery, 90th (City of London) Field Regiment R.A. in Holland. 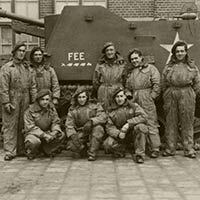 February 1945: Self-propelled gun 'Fee' and crew, F Troop, 465 Battery, 90th (City of London) Field Regiment R.A. in Holland. 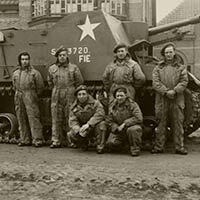 February 1945: Self-propelled gun 'Fie' and crew, F Troop, 465 Battery, 90th (City of London) Field Regiment R.A. in Holland. 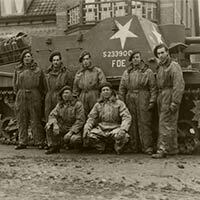 February 1945: Self-propelled gun 'Foe' and crew, F Troop, 465 Battery, 90th (City of London) Field Regiment R.A. in Holland. 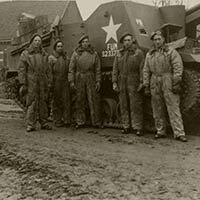 February 1945: Self-propelled gun 'Fum' and crew, F Troop, 465 Battery, 90th (City of London) Field Regiment R.A. in Holland. March 1945: Lt. Col. I.G.G.S. 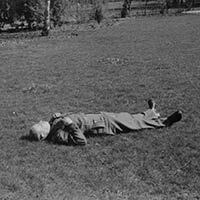 Hardie DSO R.A. takes a nap on the grass at RHQ (Regimental Headquarters) Mess, Vlijmen (North Brabant). 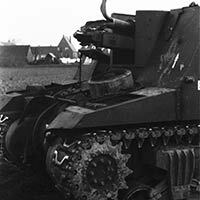 April 1945: 'Excalibur' after a premature (detonation) in the bore, Vlijmen, Holland. May 1945: F Troop regimental line-up, 'Aurora', 'Achilles' and 'Beau Geste', Waalwijk, Holland. 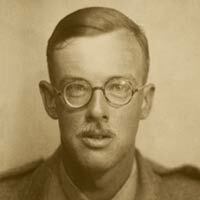 8 December 1945: Identity card photo, 277651 Lt. O.H. 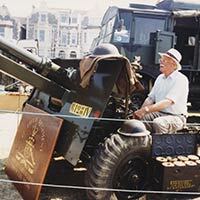 Perks R.A.
1947: Russian Gun at Frie Baton, Guernsey. 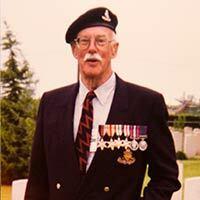 6 June 1994: Oliver at the D-Day Remembrance at Bayeux cemetery. 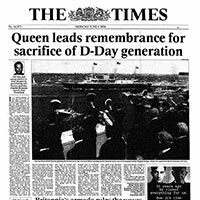 6 June 1994: D-Day Remembrance on The Times front page. 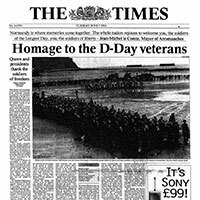 7 June 1994: D-Day Remembrance on The Times front page. 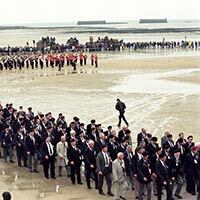 7 June 1994: Front page photo of the D-Day Remembrance from The Times. Oliver can be seen marching past at the far right. 2006: Oliver at an R.A. event. 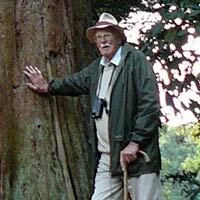 2010: Oliver celebrating his 90th birthday with his adopted Wellingtonia tree (Sequoiadendron giganteum) at Westonbirt Arboretum. June 1945: 2nd Army Thanksgiving Service on Conclusion of the Campaign in North West Europe 6 June 1944 to 5 May 1945. Cover page. June 1945: 2nd Army Thanksgiving Service on Conclusion of the Campaign in North West Europe 6 June 1944 to 5 May 1945. Title page. 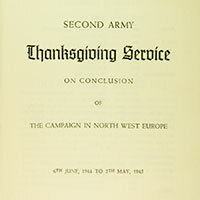 June 1945: 2nd Army Thanksgiving Service on Conclusion of the Campaign in North West Europe 6 June 1944 to 5 May 1945. 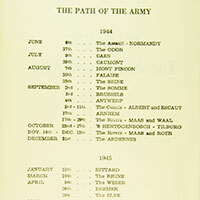 The Path of the Army timeline page. 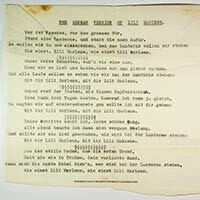 The german version of Lili Marlene. 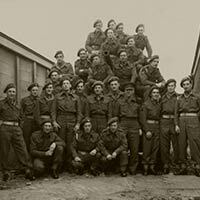 December 1943, The "Black Bull" Sawston; Whittlesford; Lane near Sawston; Rhyl February 1944: Waterproofing course; F Troop lines. January 1944: Whittlesford; Presentation of 'Footballer of Loos' replica by London Irish Rifles to 465 Field Battery. 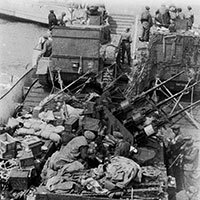 3-9 June 1944: Waiting to embark D-3; LCT 2005 being taken in tow D+3; Deck of LST. June-July 1944: Normandy; F Troop at Juaye-Mondaye; Near Villers-Bocage. August 1944: Gacé; F Troop at Quesnay-Guesnon; Pat Ross; Mike Norris; 'Grub-Up! '; Oliver enjoys a quick smoke; Gunner Winnard shaving. 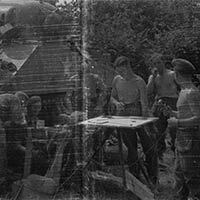 3 September 1944, Prisoners at Mons-en-Pévèle; 5 September 1944: Gun position at Brussells; Near to Albert canal; Sergeant Scott (centre) on 'FEE'; November 1944, Nijmegen, Mike Shepheard at work; Useful Padre. October 1944: French 75mm AA (anti-aircraft) gun; F Troop gun position, Ressen-Bemmel (near Nijmegen); John Winder (Signals); Dutch girl. November 1944: Nijmegen 'Island'; RHQ (Regimental Headquarters); Flooded Rhine; Ressen-Bemmel, looking towards Arnhem. 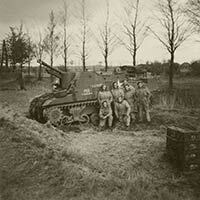 Xmas Day 1944: CO's tank 'Mary' with crew; Terheijden, North Brabant, Holland, January 1945. 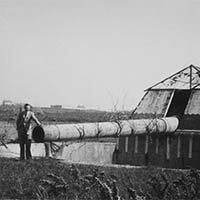 March 1945: water tower at Vlijmen (North Brabant). 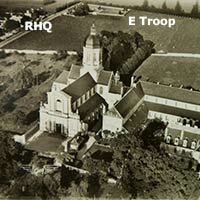 March 1945: RHQ (Regimental Headquarters) Mess, Vlijmen (North Brabant); Doc, Harry Brunkhoff and Padre; Lt. Col. I.G.G.S. 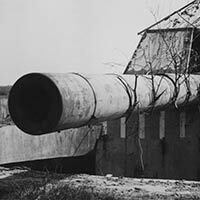 Hardie DSO R.A.
April 1945: E Troop guns passing through Vlijmen; 'Excalibur' after a premature (detonation) in the bore. 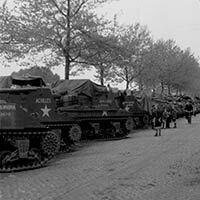 April 1945, Waalwijk, Holland: Views from CO's car (90th Field RA). Pat Ross, Arthur Stait, Eric Morrow and Doc. June 1945: River Maas at Drimmelen; Misuse of grenade no. 36! ; Francis Holland. 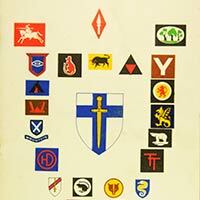 May 1945: F Troop at Waalwijk; Major Wells and OHP party; Regimental line-up. June 1945: German SP 7.5cm (assault gun) near Bochum; Lake in Ruhr valley near Essen; Roy Johnsen by river Ruhr. 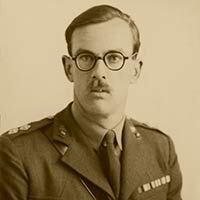 April 1946: Course shooting at Bir 'Asluj; Mike Minford after a tiring day; Sergeant Bowen; 39 battery firing on regimental target; Bombardier Frewin. Copyright © 2010-2013 The Estate of Oliver Perks. All Rights Reserved.